You are here: Home / Communities / Will this be the new norm for lot value in East Manhattan? Will this be the new norm for lot value in East Manhattan? 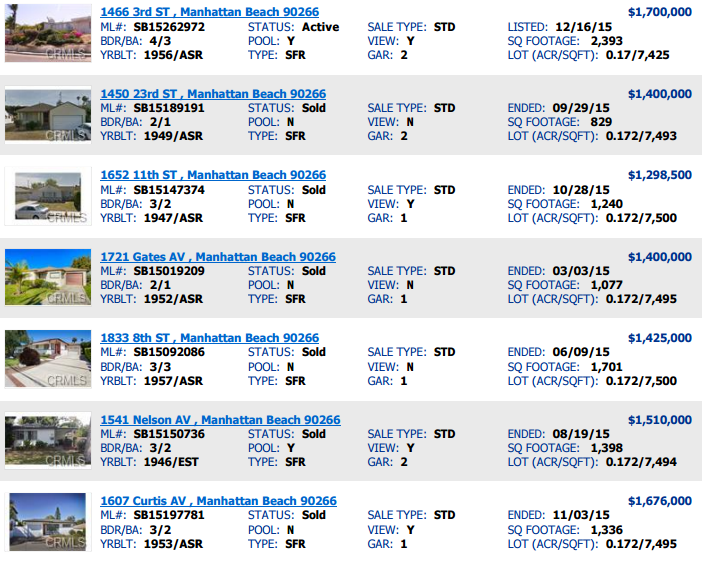 It will be interesting to keep our eye on the recent listing at 1466 3rd Street in the Mira Costa area of East Manhattan Beach as it will indicate a pretty significant rise in “lot” value over the past year. Whether the home is simply overpriced at $1,700,000 or an indication that land values have gone way up is unknown but it will certainly give us an idea as to whether these larger 7500 foot lots are so in demand by buyers and builders alike that they’ll go up to a price well above the 2015 norm. We're sorry, but we couldn't find MLS # SB15262972 in our database. This property may be a new listing or possibly taken off the market. Please check back again.